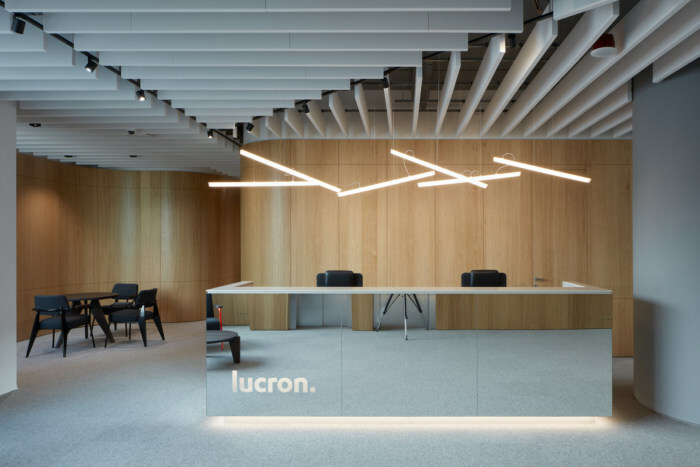 The use of simple colors and materials and the integration of sophisticated and technical details make for a lasting impression at the LUCRON Development offices in Bratislava. Čechvala Architects realized the office design for, LUCRON Development, located in Bratislava, Slovakia. The new premises of LUCRON Development represent a focus on quality and professional responsibility. It was important for LUCRON that the interior design would create a space with a character that could be identified with and would leave a lasting impression. Architects focused not only on the selection of materials but also on modern and innovative technical details that are not immediately visible. They created a blend of materials that naturally complement each other with their simplicity and organic colors creating a backdrop for daily life. In contrast the southern part purposefully applies the flexible office theory. Dominant are large desks suitable for hosting consultations and meetings. Another prevailing feature of the layout are offices for managers called ‘Cottages’ creating fixed islands within the office where each ‘Cottages’ represents a different department of the organization. High quality acoustics and autonomous lighting systems complement pleasant working environment. The interior as a whole is a symbol of a new trend and the company extent that LUCRON represents.